One donor-funded initiative that has featured centrally in discussions about supporting LDCs to better identify their trade development priorities is the Integrated Framework (IF) for Trade Related Technical Assistance (TRTA). The IF was established in 1997 by the main multilateral agencies – International Monetary Fund (IMF), International Trade Centre (ITC), UNCTAD, United Nations Development Programme (UNDP), World Bank and World Trade Organisation (WTO), working on TRTA to provide better coordinated and more effective TRTA to assist Least Developed Countries (LDCs) to integrate into the global economy. The IF aims to deliver trade related assistance to participating LDCs by first identifying priority TRTA needs through Diagnostic Trade Integration Studies (DTIS), with needs then prioritised in the action matrices. The aim is then for the priorities identified in the action matrices to be integrated into national development strategies such as Poverty Reduction Strategy Programmes (PRSPs) that are funded initiatives. About 25 LDCs have completed DTIS and identified priority actions and more than 10 LDCs have either initiated or are soon going to initiate their DTIS process. However, since its establishment the IF has faced significant problems. One of the most prominent among the problems is – lack of country ownership and limited engagement of in-country stakeholders (especially from civil society) with its related processes. In response to problems such as ownership, a range of reforms have recently been proposed for this facility which will contribute to its emergence as Enhanced Inetgrated Framework (EIF). The most relevant in relation to ownership is the proposal to establish an IF National Implementation Unit (NIU), a multi-stakeholder group representing the government, the private sector and the civil society. The NIU has been established with the objective to lead the operationalisation of the IF in each country. The Zambian government has already put in place an IF NIU comprising Ministry of Commerce, Trade and Industry (MCTI) as the focal point advisor and National Trade Expert. Discussions have been ongoing with regard to the day-to-day tasks of the IF NIU. Additionally, a Trade Expansion Working Group (TEWG) has been established and Consumer Unity and Trust Society (CUTS) has represented and participated in the development of the action matrices which is basically a Priority Action Plan. However, the composition of the NIU still remains predominantly government and hence needs CSO involvement. In contrast, CSOs such as farmer groups, small-scale producer groups, community-based organisations, faith based organisations and women organisations represent, not only a majority of the economically active population, but also importantly the vast majority of those who are economically marginalised. It is, therefore, these organisations that are best suited for exploring and articulating the needs of those who will benefit most from production and trade development. However, it is precisely these stakeholders that are least prepared to play an active role in policy discussions surrounding production and trade. These groups commonly suffer from financial and human resource constraints; lack of expertise in working on the technicalities of production and trade policies; and encounter political marginalisation in trying to engage with such policy issues. These factors limit the ability of these organisations to effectively mobilise their constituents, develop home-grown and suitable policy responses and advocate these to policy makers. It is, therefore, vital that any effort to generate and implement strategies for promoting production and trade development in the poorest countries includes an active effort to involve CSOs and provide them assistance to play a major role in these processes. to create a wider platform for the debate over the EIF processes. The workshop was attended by 50 participants from various organisations including representatives from the government and the Finnish Embassy, private sector, civil society organisations (CSOs) and the media. create a wider platform for the debate over the EIF processes. The workshop was well attended with participants from public and private sector, CSOs, donors and media. The workshop was officiated by the Kitwe District Commissioner who commended CUT ARC and the Finnish Embassy for implementing the EIF project. The importance of building capacity of various gender based organisations follows from observations that, these groups are often not included in trade policy formulation in Zambia. Through CUTS ARC Lusaka’s interaction with these organisations in Zambia, it was evident that they had little or no capacity in articulating and debating issues relating to trade agreements such as EPAs and WTO and also taking advantage of initiatives such as the EIF. The vast knowledge gap indicated the significance of hosting such a workshop. If not well negotiated, trade could bring about negative results on gender equality. Trade plays an important role in the economic development both at national and domestic level. Empirical data has so far shown differential impact of trade policies on women and men as trade policy making processes have little or no gender analysis in Zambia. It is worth noting that, women play a significant role in economic development although they were mostly employed in the informal sector, they play only a marginal role in trade process which was reserved to the informal sector. In this regard it becomes extremely important that they are exposed to trade policy process and other initiatives such as the EIF which could contribute to their empowerment and integrate them into the world trading economy. 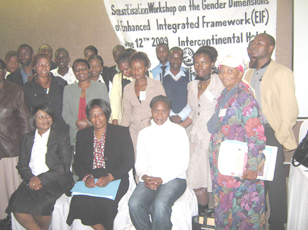 strengthen capacity of CSOs and trade negotiators to effectively engage gender in trade policy formulation in Zambia. CUTS ARC organised a roundtable meeting for the CSOs on the EIF process in Zambia on February 27, 2009 with the intention of engaging and updating the CSOs to share information on the current status of the implementation of EIF in Zambia, discuss and develop CSOs’ position on the EIF process in Zambia, develop policy recommendations from CSOs, updating the CSOs on the recommendations from the sensitisation workshops held in various provinces. On May 08, 2009 CUTS ARC organised a roundtable meeting for the private sector. The aim of the meeting was to share information on the current status of the implementation of EIF in Zambia, discuss and develop private sector position on the EIF process in Zambia and to develop private sector policy recommendations. The meeting drew a relatively small but vibrant group of 10 participants who were from the private sector and media. 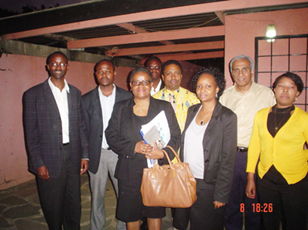 On April 09, 2009 CUTS ARC was privileged to host a roundtable meeting with the Executive Director of the EIF Secretariat, Dorothy Tembo. The main aim of hosting this meeting was to familiarise the EIF ED with what CUTS was working on the EIF process in Zambia and to also get an update from her on the status of the EIF process. The informative and highly interactive roundtable meeting had 10 participants from CSOs, and private sector organisations.